Late last night or early this morning, depending on your perspective, we added a couple of shots from this week's State Farm Classic. Here a look at some of the memorable photos from this week's coverage. If you are not following us on Instagram, do it today to keep up on the latest highlighted photos from our image archive. Follow @photonewswire on Twitter, too. See more game photos or pictures of a specific athlete by requesting an archive search today. Go here for details: Archive Search Request. 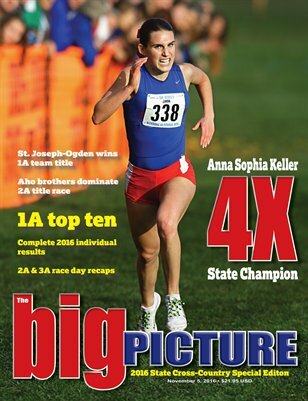 Our commemorative 2016 state cross country edition is now available. Inside, you will find recaps from all six races, complete results and photos of more than 70 athletes who competed at this year's IHSA state cross country meet. Below are sample pages from the 54 page edition. The issue is available in print and as an instant download. Follow this link to preview the entire edition here and order your copy today. One of the best kept secrets about our special editions is you can order your copy of this Big Picture magazine with your favorite photo from inside on the cover. For small up-charge, we'll move things around a bit inside and put new a cover featuring you or a runner from your school to create a personalized copy for your scrapbook, coffee table or collection of memorabilia from this season's finale. Want to know if we can create a personalized copy for you or your team? Send us a quick message via our contact page. Good fishing requires positioning. Baiting your hook and dropping it in a place where there are fish is a start to successful fishing. A salesman needs prospects and attitude. One shoe salesman was sent to Africa and called home crying, "Get me out of here! Nobody wears shoes!" Another salesman was sent and called back saying, "Send me every pair of shoes in the warehouse. I've never seen so many prospects!" Selling requires having a product that people either need or very much want. People don't need candy but they want candy so they buy it. People don't really want to spend money on insurance but they need it. Sell what people want or need and you will sell. Obtaining a certain job requires positioning. Becoming a schoolteacher requires college, teacher education, supervision and certification. You have to work hard and position yourself for potential opportunities. A young man wants to be lucky in dating and maybe marriage. Yet, he may refuse to change his lifestyle. He doesn't want to hold down a job, refuses to lose twenty pounds and is rude and inconsiderate. Thus, he refuses to try to position himself for potential dating prospects. Every facet of life requires positioning. Positioning yourself for stability, success, or a major change always requires lots of time, training, sacrifice and commitment. Nothing is guaranteed, but with positioning comes potential. Retiring at 65 most likely requires sacrifice the 30 years prior. It doesn't always require 30 years. A friend of mine was flat broke at 50. He rented an old abandoned hamburger stand with an option to buy. He and his wife cleaned it up and worked it hard for sixteen years. They made the best food in town and averaged pocketing over $300,000 a year. They were able to retire. He knew at the age of 50 that he had to position himself if he had any chance of truly retiring. Where do you want to be and what do you want five or ten years from now? Start positioning yourself today and in a few years it just might work. However, it never comes with a snap of the finger. A garden is produced from preparing the soil, planting, cultivating and tending to the field. In time, you will reap some kind of a harvest if you don't quit. A lot of counties across America are hurting economically. People have left and nobody seems to be coming back to take over. The future of depressed areas begins today and it will probably take years to position these areas for economic stability. We all want it now, but we have to start today with hopes for tomorrow. America needs to recuperate. We have debt to pay. We have an infrastructure to rebuild. There are millions of jobs that we must recapture and bring home. We have a military to strengthen and healthcare challenges. We can get to where we need to be. Getting there will take hard work and positioning ourselves to be where we need to be to accomplish what we want to do. One of the things the makes Champaign-Urbana a great place to live and play is its large, active tennis community. Brandon Lenfert, head tennis pro from the Atkins Tennis Center, announced a new tournament for competitive players in the area. Atkins, home of the Fighting Illini tennis program, will host their first annual Fighting Illini Fast 5 mixed doubles tourney on Saturday, April 9th. The tournament is a mixed doubles only event set in a 4-hour compass draw format. At the end of each round, the winners continue in their tournament in the same direction, while the losers change directions. There are no eliminations. Each doubles pair continues to play until the time limit has been reached. Compass draws provide a great way for players to face opposing teams and players of different abilities and styles. All duos will play a best of 5 game set. Games are tallied with no-ad scoring and pairs must win by two games. Ties will be broken with a 9-point tiebreaker(first to 5 points) at 5-5. The competition will begin at 4pm with match snacks and Gatorade will be provided for players through out the one day event. Entry fee is $40.00 per doubles pair and interested players can register in person or call the Atkins Tennis Center at 217-244-8562 to reserve their spot in the draw. Life is lived once. Be happy. What should you be doing today? What do you want to be doing today? Where should you be today? Where do you want to be today? An old friend who recently died said, "Do what you enjoy." Life is not only about our gratification. We have family members and work associates who are impacted by our decisions. To totally go off the wall and make decisions that are only about us is careless. To never make decisions that are about us is stupid. Another dying friend recently told his Facebook followers to pursue life and go for whatever dreams or goals they had in life. While he had pursued many of his I also got the message that he had unfinished business or dreams that he had cast aside and never pursued. Don't live your life with regrets. Get in the game and enjoy whatever time you have to play the game. Or, get on the road and enjoy the scenery along the way. Life for many people is watching life go by. We watch others live on television. We watch others at sporting events. We sit on the sofa and vegetate, get depressed, eat too much, get fat and then need drugs to get us through the day. Life is for living. We weren't created to watch life go by. Life was never intended to be a non-active existence. Today get up and do something and do it a lot. As long as it's legal, moral and healthy what do you have to lose? Don't spend a lot of time asking others what you should be doing. They really don't know your heart. Ask yourself, talk to God about it and then move forward with living and be happy. Liberty's shots fell anywhere but through the orange hoop in their state semifinal contest against LeRoy early Friday afternoon. Scoring just 8 points in the first half on a frustrating 3-for-23 start, the Eagles fell 48-32 to eventual Class 1A champions LeRoy at the IHSA Basketball State Finals. Entering the Final Four with a record of 29-4, it was the third time in program history the Eagles had a shot at a state title. In 2005 and 1981, Liberty finished the season with fourth place trophies. Starters Reed Wolfmeyer and Tayton Roe led Liberty's scoring effort. Roe, who was 2-for-2 from the free throw line, finished with 12 points. Wolfmeyer buoyed his team with 10 points and 4 steals. Cole Wellman was credited with 6 of the team's 25 rebounds and chipped in 5 points in the loss. LeRoy (27-5) was led by D1 star Matt Chastain. The 6'6', 190-lb senior led all scorers with 20 points - 6 under his season average - and hauled in a game-high 14 rebounds off the glass. Teammate Nick Perry contributed 10 points, three shy of the pair defeating Liberty by themselves.